Thought I forgot about you didn’t you? I can’t, you won’t let me. I feel like I’ve known you 4-eva! I remember when I first met you how you so annoyed me. I remember thinking, “self, how her friends deal with her, I don’t know”. I still think that only then I wasn’t no friend of yours and now you’re my best friend. Paula Abdul was right girl, Opposites Attract. You’re thin, I’m not. You’re loud, I’m not. You’re Cuban, I’m not. We do have one thing in common though, our hearts. We both would walk the earth if it meant making someone happy. I know I’m sometimes mean to you Nancy. I know you don’t take it personal but blame it on me being one big angry monster. Oh never mind, that was someone else. Nonetheless, you don’t take it personal. You let me speak my mind and voice my frustrations and at the end of the day you still love me just as much. I’m very lucky to have you in my life. Not because you let me be mean to you but because of all that you are. I'm sorry that I'm like that. I'm working on it. I ask God every day for some patience. He's giving it to me slowly. Thanks for being patient. Please try to drive faster though when a sista has to go. I love you. Happy Birthday Viejita! Here’s to 30 more. why is she dressed that way? Did she lose a bet? 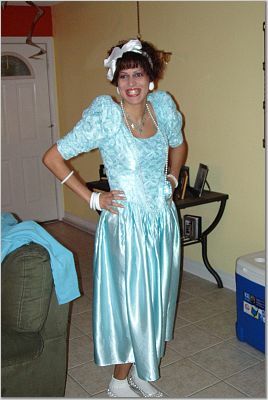 She had an 80's theme birthday party. I know you do girl. You wear it out on dates. :-) No wonder he fell in love with you.